Infant/Toddler Specialist Nicole Shea, left, represents the S.C. Program for Infant/Toddler Care at a January meeting to launch a mentor training program for child care providers in South Carolina and Georgia. At right is Monica Cohens, owner of Lea’s Little Lambs in Greenville, S.C.
Child care in South Carolina is getting a boost from a new program to spread expertise through a network of well-seasoned caregivers. The S.C. Program for Infant/Toddler Care is working in partnership with the Georgia Program for Infant and Toddler Care to develop a team of mentors who can share their experience with other child care professionals. 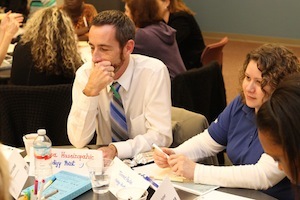 The mentor training began with a kickoff meeting in Greenville in January. 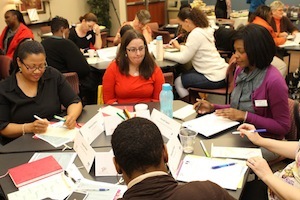 At the first gathering, program leaders congratulated the mentor training participants on their commitment to child care. 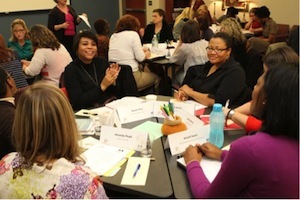 The mentor training is being conducted by Quality Assist in Atlanta. Participants are attending 44 hours of classroom training geared toward helping them be effective mentors to other infant/toddler teachers. There are 16 participants from South Carolina and 13 from Georgia. Laura Johns, director of GAPITC, noted that the mentor trainees represent many types of child care models including faith-based, family child care, for-profit and nonprofit. 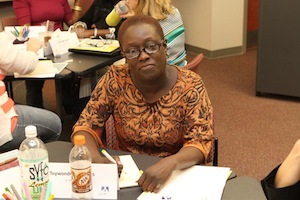 She applauded the caregivers’ willingness to lead other professionals in their field. Leigh Bolick, director of South Carolina Department of Social Services’ Division of Child Care Services, also commended the mentoring participants for being part of the training. 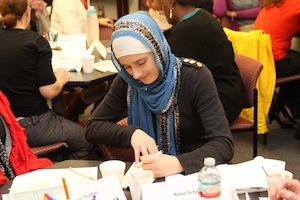 Mentor training participants will learn about topics such as adult development and learning, diversity, effective communication, leadership, the mentoring process and early childhood best practices. Bobby Cagle, commissioner of Bright from the Start: Georgia Department of Early Care and Learning, said the mentor training is essential for developing better infant/toddler child care and that the top childcare providers were selected to participate. SCPITC is a statewide program that educates child care providers about the best ways to support infants’ and toddlers’ early learning and healthy development. SCPITC has a statewide network of infant and toddler specialists, supported by SC DSS, who provide free training and coaching to child care providers at their care locations. Schnake, director of SCPITC, is the recipient of the 2012 Marian Wright Edelman Advocacy Award, designed to honor a person who has made a significant contribution that changes the lives of children in positive ways. 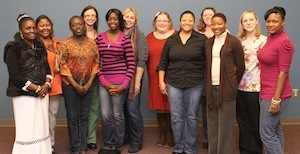 Schnake established the SCPITC Network in 2006 with the support of the S.C. Department of Social Services. 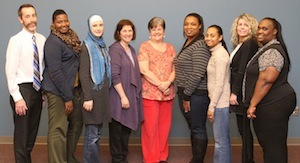 SCPITC is part of the University of South Carolina’s College of Education in Columbia, S.C.
For details about SCPITC, call (803) 777-0092 or visit scpitc.org. SCPITC offers a free online expert advice forum for parents and caregivers.